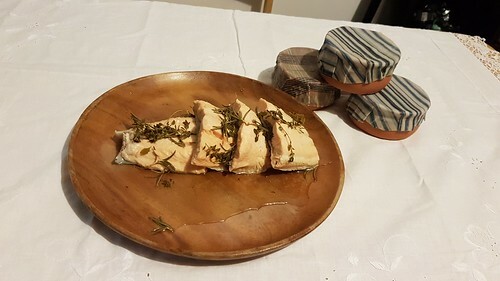 TAKE your Salmon and boile him in faire water, rosemary and time, and in the séething put a quart of strong Ale to it, and so let it boile till it be enough, then take it from the fire, and let it coole, then take your Salmon out of the pan, and put it into an earthen pan or woodden boule, and there put so much broth as will couer him, put into the same broth a good deale of vineger, so that it be tart with it. Thomas Dawson, The Good Huswife’s Jewell part 2, 1597. Take your Salmon and boil him in fair water, rosemary and thyme, and in the séething put a quart of strong ale to it, and so let it boil till it be enough, then take it from the fire, and let it cool, then take your salmon out of the pan, and put it into an earthen pan or wooden bowl, and there put so much broth as will cover him, put into the same broth a good deal of vinegar, so that it be tart with it. I think one of the reasons a lot of people shy away from cooking fish is because it’s very easy to overcook if it’s fried or baked in an oven. Poaching the fish, like this, is a much better method of cooking fish; the poaching liquor keeps the fish moist while it’s cooking, and you also have a lot more control over the heat. If you have always been wary of cooking fish, give this recipe a try – it’s easy, quick and delicious. Put the water, beer and herbs into a pot and bring to the boil. Meanwhile, ensure the bones have been removed from the salmon, then add it to the boiling poaching liquid. Return the liquid to the boil, then reduce to a simmer. Cook until the salmon is completely cooked through (approximately 10 minutes). You will need to make a small cut into the salmon to check. 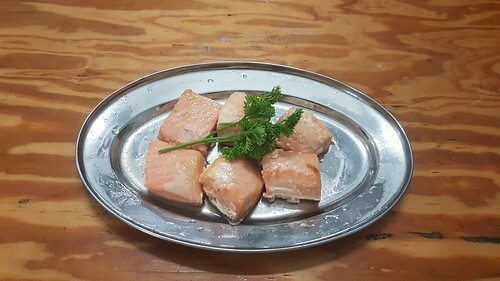 Remove the salmon from the cooking liquid to a ceramic or wooden serving platter and allow to cool slightly, then pour a little of the poaching liquid over the fish. Pour on the vinegar and serve. Black, Maggie. The Good Housewife’s Jewel. To stew a small Salmon, Salmon Peal, or Trout. it also some whole cloves, large mace, slic’t ginger, a bay-leaf or two, a bundle of sweet herbs well and hard bound up, some whole pepper, salt, some butter, and vinegar, and an orange in halves; stew all together, and being well stewed, dish them in a clean scowred dish with carved sippets, lay on the spices and slic’t lemon, and run it over with beaten butter, and some of the gravy it was stewed in; garnish the dish with some fine searsed manchet or searsed ginger. Robert May, The Accomplisht Cook, 1660.
it also some whole cloves, large mace, sliced ginger, a bay-leaf or two, a bundle of sweet herbs well and hard bound up, some whole pepper, salt, some butter, and vinegar, and an orange in halves; stew all together, and being well stewed, dish them in a clean scoured dish with carved sippets, lay on the spices and sliced lemon, and run it over with beaten butter, and some of the gravy it was stewed in; garnish the dish with some fine grated manchet or grated ginger. Stuff the cavity of the trout with the cloves, mace, pepper and herbs. 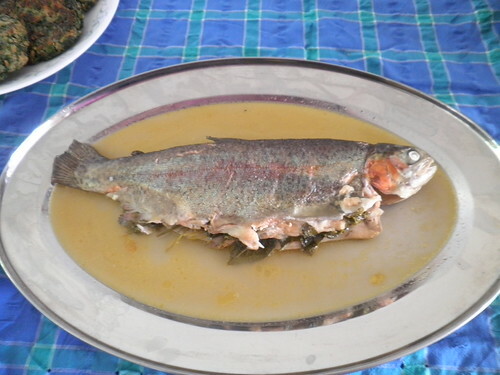 Put the trout in a shallow pan with the wine and half the butter, and add enough water to cover the fish. Squeeze out the juice of the orange into the pan, and add the halves to the pan as well. You will know the fish is cooked when the eye goes opaque. To serve, cut the crusts off the toast, if using, and line a serving dish with the toast and the lemon. Lay the fish on top, then dot the flesh with the rest of the butter, and pour over some of the cooking liquid. Salmon with orange. This was cooked for a feast, and it was easier to bulk cook ready cut salmon fillets than an entire fish. May, Robert (1685 edition) The Accomplisht Cook. Take water and yest, and a good dish of butter, and Onions chopt, and a lyttle pepper, & when it hath boyled a litle while, then see that your Muskels bee cleane washed, then put them into the broth shels and all, and when they be boiled wel, then serue them broth and all. Thomas Dawson, The Good Huswife’s Jewell, 1596. Take water and [brewing dregs], and a good dish of butter, and chopped onions, and a little pepper, and when it has come to the boil, then see that your mussels are washed and clean, and put them into the broth shells and all, and when they be well cooked, then serve them broth and all. Discard any mussels that are slightly open. Combine the brewing dregs, water, onion, butter and pepper in a heavy bottomed pot, and bring to the boil. 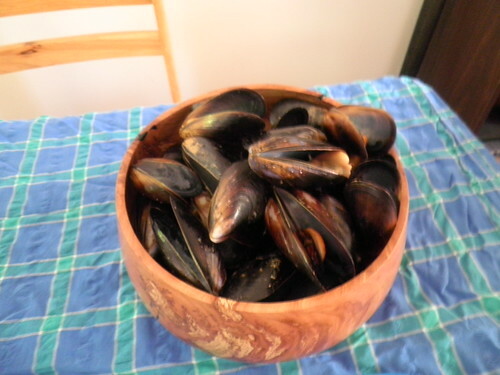 When the steaming liquid is boiling, put the mussels in the pot and put the lid on. After about 5 minutes check the mussels. Any that have opened are ready to eat; discard any that haven’t opened. “Yest” is the frothy, watery dregs left at the end of brewing beer. If you aren’t fortunate enough to know a bunch of historical brewers, use a good quality wheat beer. In ostreis: piper ligusticum oui uitellum acetum liquamen oleum et uinium, si uolueris et mel addes. For oysters: pepper, lovage, egg yolk, vinegar, liquamen, oil and wine. If you wish, add honey. Christopher Grocock and Sally Grainger, Apicius, 293. In a bowl with a narrow bottom and steep sides, add the egg yolk, the lovage, the pepper, and half the vinegar, fish sauce and wine. Whisk together. To make the sauce in the likely Roman fashion, use two thin sticks (such as chopsticks) to whisk the ingredients together. Add the oil, a little at a time, while continuing to whisk. It can help to have a second person adding the oil. Be careful not to add the oil too quickly, or the egg yolk will curdle. You can add the oil more quickly when around half has been added. When the desired amount has been made, add the rest of the vinegar, fish sauce and wine, adjusting the flavour as required. To make the sauce in a painless, modern fashion, use a stab mixer to whisk the mixture while slowly adding the oil. There is much less risk of curdling if using a stab mixer. 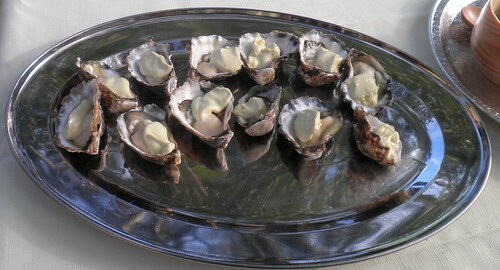 Serve the sauce as a dipping sauce for the raw oysters, or spoon the sauce on the oysters in their shells. I used the stab mixer method to prepare this sauce. I have successfully made this sauce in the past with the chopsticks to see if it’s possible without a balloon whisk; however it is very hard on the arms. Oysters were very popular in Rome. They were a key ingredient in Embractum Baianum, a seafood casserole that was a specialty of Baiae, an expensive, luxurious resort in the Bay of Naples. According to Pliny the Elder, it was one of the first seafoods to be farmed. Lovage (Levisticum officinale) is a plant that appears frequently in Roman cooking. It has an extremely strong celery scent. Sally Grainger and Patrick Faas believe the seeds were used more frequently, as it is usually listed amongst the spices in Apicius. I feel either the leaves or the seed can be used, as they both have a similar taste, however the seed is probably more appropriate in a cooked dish. I used the leaves here. If lovage leaf or seed is unavailable, celery leaf or seed is a good substitute. I grew the lovage in my garden. A lot of modern recipes for mayonnaise warn against using extra virgin olive oil for mayonnaise, as the strong taste can overpower the mayonnaise. As the Romans didn’t have an alternative, presumably they were used to the flavour. However, I have noticed the Roman mayonnaise type sauces have strong flavours added; the oyster sauce uses lovage, while the squid sauce uses lovage, coriander, celery seed and honey, not to mention the usual fish sauce. I wonder if this was to counteract the flavour of the olive oil. I have found using a bowl with a narrow base and steep sides is much better for making mayonnaise type sauces, presumably because there is less room for the egg to spread out, allowing the oil to emulsify properly.